Thank you for visiting our website. Please feel free to contact us by phone or using the form below. We appreciate your visit and look forward to hearing from you. Merge onto 5 Mile Rd. Turn right on 5 Mile Rd. Exit #69. 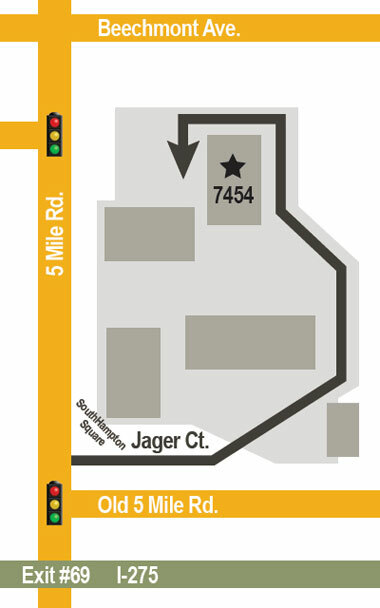 Turn Right on Jager Ct.
End at 7454 Jager Ct.
Take Exit 1A & merge onto 275 E.
Take Exit 69 for 5 Mile Rd. Turn Left at 5 Mile Rd. Turn Right at Jager Ct. Merge on I-275. Exit 16 Take Exit 69 for 5 Mile Rd. Merge onto 5 Mile Rd. Turn Left on Jager Ct. End at 7454 Jager Ct.